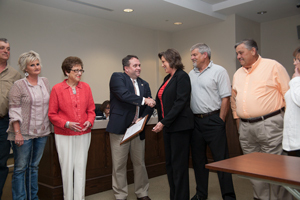 Mamie Caison, Brunswick County’s longtime Soil and Water Conservation District Director, was recognized by the Brunswick County Board of Commissioners Monday night for receiving the National Conservation District Professional Award. The award is presented annually by the National Conservation District Employees Association to recognize professionalism and dedication in the people behind the nation’s conservation district programs, and to recognize those who believe in conserving the natural resources and making the world a better place. Surrounded by family, Mamie Caison receives a proclamation from Brunswick County Board of Commissioners Chairman Frank Williams, recognizing Caison for receiving the National Conservation District Professional Award. Caison, who has been with the Brunswick County Soil and Water Conservation District for more than 29 years, was presented with the award at the National Association of Conservation Districts Annual Meeting in Denver earlier this year.